Create your own custom acrylic awards and trophies based on your logo in any size, shape and budget. 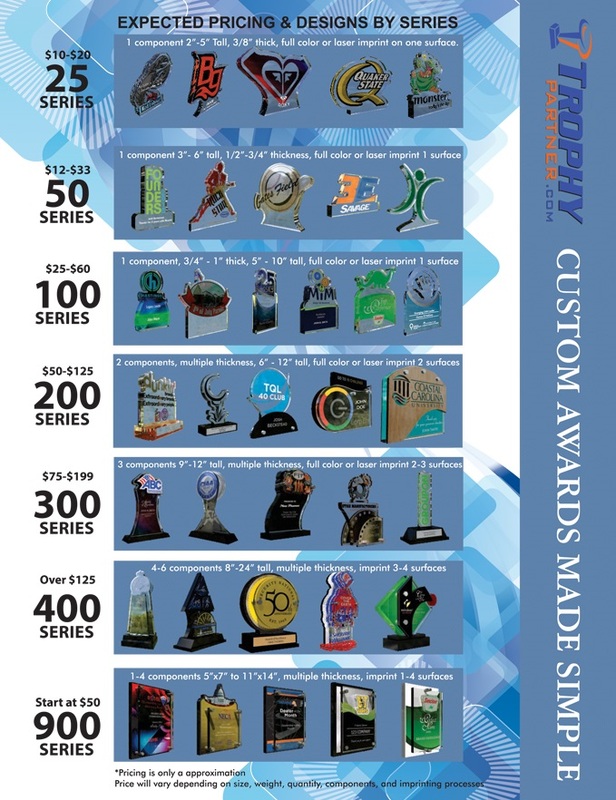 Our custom acrylic trophies are built around your logo and are perfect for corporate recognition programs, service awards, or to mark a special event. The possibilities are endless. We provide free design work. Simply email us your logo along with some basic information and let one of our artists go to work. Within 2-3 business days we will provide 2-3 concepts for you to review. Tweak the designs until we have created the perfect trophy for you. Our process usually takes 3-4 weeks to complete: one week for design, two weeks for production, and one week for shipping. If you are in a hurry, we still may be able to help. Let us know. Not sure you can afford something custom? Most likely you can. Check out our custom acrylic awards pricing guidelines sheet below to see how much a typical design will cost or email us your budget and we will let you know what we can make within your price range. A $400 minimum purchase is required. Take a look at our video to see what we have done for other customers.